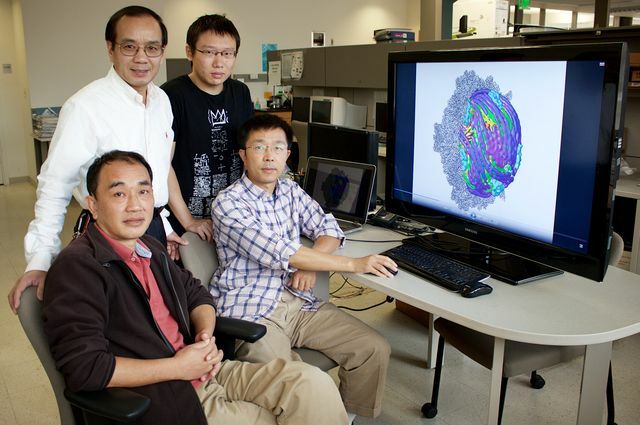 Researchers led by Hong Zhou (top left) found that the dsRNA virus uses proteins on its surface to sense its environment and that when conditions are optimal, those proteins turn the switch on inside the virus. In separate studies published in the peer-reviewed journals eLife and Nature, scientists at the California NanoSystems Institute at UCLA have revealed the three-dimensional atomic structure of a double-stranded RNA, or dsRNA, virus. The research demonstrates for the first time how viruses sense environmental conditions inside a host cell to trigger transcription, and presents key findings about how the dsRNA genome is organized inside the virus and RNA’s mechanism for self-replication. The researchers also discovered the biological nano-switch that turns on transcription — the process by which RNA self-replicates — and compared the switch’s structure in the “off” and “on” states to determine why environmental conditions activate it. They now know that the dsRNA virus uses proteins on its surface to sense its environment and that when conditions are optimal, those proteins turn the switch on inside the virus through a signal transduction pathway. This activates RNA transcription. The research was led by Hong Zhou, a professor of microbiology, immunology and molecular genetics and faculty director of UCLA’s Electron Imaging Center for Nanomachines. For both studies, researchers analyzed the cytoplasmic polyhedrosis virus, or CPV, which infects insects. Zhou said the team focused on CPV because it is the simplest dsRNA virus. The studies are the culmination of research Zhou began with his colleagues in the 1990s, when electron microscopes were far less powerful than they are today. Double-stranded RNA viruses are the largest family of viruses (others include retroviruses and papilloma viruses). One well-known dsRNA virus is rotavirus, which causes diarrhea in humans and each year kills half a million people around the world, mostly children in developing countries. The UCLA scientists’ explanation of the process through which dsRNA replicates — and the conditions in which it takes place — gives scientists targets for new drugs that could be developed to combat dsRNA viruses. Nanoscale biological complexes such as viruses are difficult for scientists to see because of their vanishingly small sizes. To put their dimensions in context: The difference in size between a virus particle and a football is about the same as the difference between a football and the planet Earth. Both studies were conducted using UCLA’s Titan Krios cryo electron microscope, a highly sophisticated machine in which flash-frozen biological samples are preserved in their native state. Recent advances in cryo electron microscopy have enabled scientists to build — with unprecedented, atomic-level detail — 3-D images that are capable of revealing the chemistry governing the assembly of the biological complexes. The eLife study found that a small molecule called S-adenosyl-L-methionine, or SAM, can activate transcription by binding to a turret protein on the virus’s shell. The researchers discovered for the first time that when SAM binds to one region of the turret protein, it changes the virus shell, which enables another region of the turret protein to bind a small molecule called ATP and break it down. The energy released from breaking down ATP causes further changes to the shell that activate RNA transcription. 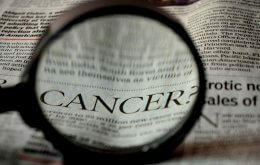 The study’s lead author was Xuekui Yu, a UCLA project scientist in microbiology, immunology and molecular genetics. In the Nature study, the researchers imaged the organization of the dsRNA genome and proteins inside the virus. They then captured images of the process of transcription by comparing the structure before and after. Xing Zhang, the study’s lead author and the scientific director of UCLA’s Electron Imaging Center for Nanomachines, said that viruses are “smart” — they seem to know how to avoid replicating when it is not productive because they won’t activate unless all key conditions are present outside the virus shell. When transcription begins, segments of nascent RNA are released into the cell’s internal environment, where they package themselves in protein shells to make new viruses. These new viruses exit the cell, propagate into other cells and start the whole process again. The papers’ other co-authors were graduate student Ke Ding, undergraduate student Winston Chang, and postdoctoral fellow Jiansen Jiang, all of UCLA; and Jingchen Sun, a visiting professor from South China Agricultural University in Zhou’s lab. The research was supported by the National Institutes of Health, the National Science Foundation, UCLA and the National Science Foundation of China.